My name is Denise and I am 41 years old. I have been inspired by others to share my story. I suffer from spondylitis and fibromyalgia. I am where I am today only from pure determination to finding the answers for the symptoms I knew were not normal for my body. The road was long but at the end I feel that I have educated myself and also educated doctors along the way. Looking back now, it all began in early grade school. I had a foot operation that doctors believed was rheumatoid arthritis. Back then, I guess, there was little knowledge and continuing observation did not happen. After the surgery it seemed to have ended doctor appointments. So life went on as normal. It was not until around middle teenage years when pain, fatigue, and frustration started. I believe in my teenage years I began to be able to realize for myself that something was wrong. You start to know your own body more and notice from observing others what is not exactly normal for someone my age. Doctor appointments started. Confusion began. After some blood work was suggested, I eventually was diagnosed with Lyme’s disease and treated with amoxicillin and sent on my way. I don’t remember but I’m sure I was thrilled with this diagnosis and expecting to be back to normal very shortly. Back then you would tell the doctor what your symptoms were and go from there. After being medicated for the Lyme’s, all my previous symptoms did not subside but I continued to do what I had to and proceeded forward with my life’s plans. I graduated high school in 1988 and entered a two year business school. On April 21, 1990, I had two special events happen. I had officially graduated business school and also got married to my high school sweetheart and soul mate. Needless to say I did not attend the graduation ceremonies but instead was celebrating the start of a new life that day. We had no clue at that point all the medical adventures we were about to endure throughout our marriage. At the young age of 19 I was a wife and ready to start the family and life that every little girl dreams about forever. My husband and I were enjoying being newly weds. We worked hard and played hard. At this point I was working 12 hour days, usually six days a week. If we were not working, we were out running around enjoying our new freedom as adults. I’m assuming I put my health issues on the back burner just trying to live my life. We planned on starting a family early in our marriage and in September 1991 we were ecstatic with the birth of our son. Sure, you have fatigue with a newborn. All still seemed “normal” for my lifestyle. I wish I could remember what started me being concerned about myself again. Maybe it was realizing I had the responsibility of raising my son now and he needed me healthy. Within a year after giving birth to our son I began to see doctors again. It could be that maybe I thought it was a simple case of anemia and pain from not resting enough with a busy day to day life. To my surprise, I again was diagnosed with Lyme’s disease but not before numerous blood work appointments until a positive result was found. Another surprise with test results was that my strep level was extremely elevated. We never did find out the reason why this happened to me. I was prescribed for medicine for treatment. Medication for my Lyme’s consisted of 6 weeks of IV therapy with Rocephin which ended in allergic reaction after 2 weeks. I had to switch to 6 more weeks of IV therapy with doxycycline. It was a long two months of sitting through IV treatments but if that is what it was going to take to get better we were all for it. Now we think all is good and we will go on our way living an active life. If I only knew then what I know now…must have been in remission. In July 1994 my daughter was born and totally completed us. We had the perfect family. I remember still having “issues” but always had excuses for them. Years went by as I was raising my children and having fun being a mother and a wife. In 1999 my sister was shockingly diagnosed with cervical cancer. Needless to say, it was a heart-wrenching event for us. My sister and her husband just wanted to complete their life with a child. My sister and I had mutual thoughts for me to be a gestational carrier for her and her husband so they would be able to fulfill their dream of a complete family. There was no second thought. There was no other way I would have had it. I was thrilled to death to do this for them. This is a chapter in my biography all by itself. It was such an amazing journey and experience. Fortunately, after a few IVF tries I got pregnant with a biological child of her and her husbands. I gave birth to my nephew in February 2002. I am so thankful and blessed that I was at a healthy enough stage in my life to make a dream come true and the feelings are truly priceless. We realize now, timing for this pregnancy was impeccable. Life was good….or was it? My husband and I decided to buy a camper and put it on a permanent site in Delaware to enjoy time together and with our children. We could not have been any more excited. In May 2002 everything was set up for an amazing summer and a specialvacation spot of our very own. The first weekend there would be the weekend to change my life from ever being “normal” again. As we were outside walking around the campsite I got bit by a bug on my ankle. Who knows what exact type of pesky little bug it was. Doesn’t much matter, I suppose. My ankle swelled up and unknown to me this would be the start of years with doctor visits and exhausting frustration. My body was yelling and screaming telling me I can not hold it in any longer. My body has had enough and the bug bite had triggered everything full force. They treated me as normal for an allergic reaction to a bug bite. Seemed logical enough….right?! Oh no….wrong. At this point all the symptoms became stronger and never stopped. Headaches, aches, pains, fatigue came with a vengeance. It was a long year of symptoms and doctors trying to figure out what was going on with me. May 2003 the pain was unbearable and I ended up having very limited movement in my neck. I was put on temporary disability from work. They started testing me for Lyme’s disease again but results were negative. At this point they had diagnosed me with severe fibromyalgia, which is a syndrome that causes long-term body wide pain, but that wasn’t everything. I knew that it had to be more then just that. What was happening to my body was not caused by fibromyalgia alone. My inflammation levels were high and only rising. The prescriptions of pain medicine and valium have now begun while still trying to find more answers. After a month and a half of elevated levels the doctor started me on steroids. A month later I had an injection of Kenalog into my chest bone and 6 injections on my back from shoulder to shoulder. As I try anything at this point to relieve my pain, nothing seems to work. I went to physical therapy, massages, and water therapy. I received MRI to see if possible MS. They found 3 white spots but not enough evidence to diagnosis with MS. Neurologist appointments started only to find out that I have severe carpal tunnel in both wrists. This would be the least of my worries. The list of doctors continues. Next it would be an internal medicine doctor. My internal medicine doctor had disbelief in me from the very beginning. If I don’t flinch when you push on a sore spot it does not mean it doesn’t hurt. It just means I have a high pain tolerance and refuse to wince like a child. I delivered 3 children naturally with no pain medications. This should explain the level of pain tolerance I have. I explain to him all of my symptoms. I let him know that I believe something is wrong. For him to see me from the outside and not what I am struggling with on the inside hinders him taking me seriously. He suggested at the end of 2003 I go see a rheumatologist. This was another doctor who I would have to try and convince what is going on with me from “behind the scenes” of my body. So more doctor appointments, more medicines prescribed. Nothing worked to help me. The frustration continues and depression sets in. I got to the pathetic point of not wearing make up to appointments just in hopes of “looking” sick so the doctors would take me seriously. This was me crying from desperation. The amount of medicine they were putting into my body was insane especially when we did not have a definite diagnosis. At this time, though, anything they suggested to me I would have taken just on the chance it might relieve some of my horrific pain. February 2004 I went on permanent disability. Doctors knowing what I had was not going away but weren’t sure exactly what to call it. My rheumatologist, I’m sure, was chalking it up to a basic arthritic problems. We have come to know now nothing about me is under the “basic” category. This is when I finally realized I must take control of me. I have come to realize that it is in your best interest to educate yourself. It is very important to be your own self health advocate. No doctor knows your body as you do. Doctors do not like all the information that is available to us today via the internet. The information we are able to obtain on our own now is mind boggling. Research has to be a part of our self advocating. There is a lot of “misinformation” on the internet too, so we must be aware of this during our search for answers. We will find questions to ask and topics we think to be looked into further. Needless to say, doctors are not often amused when we question their diagnosis or lack of diagnosis. That is not for us to worry about because I look at the doctor as he is working for me. I treat it like I have “hired” him to help me find out what is wrong with me. We must work together. The doctor has his knowledge but we also have the knowledge of ourselves that nobody else has. It will take the both of us to figure out why I’m not feeling up to par. I have come to know my body so well and can tell if something is not my “normal”. I actually amaze myself at times when the littlest of change happens to my body and I can recognize it very quickly. At this time of battling to find answers, I continued to go to my rheumatologist regularly. I was still fighting for help and treatment. On March 26, 2004, I would convince all the doctors that what I was telling them was the truth. I was at my mom’s for lunch before a scheduled rheumatologist appointment that afternoon. After eating, I just didn’t feel right. My head felt weak. I knew at that point I was going to pass out for unknown reasons. I wake up minutes later to EMTs and my mom over me while I lie on her floor unresponsive. They take me in ambulance to the emergency room. I remember my mom scared to death when I awoke. The fear in her eyes of not knowing what was happening. She said it seemed that I was unresponsive for way too long. I get examined in the ER. Doctors still seeming confused about my whole situation. Finding nothing abnormal with me they were going to release me until they talked to my rheumatologist. I was beginning to connect with my physician. He knew something had to be brewing inside me now.He was beginning to believe. He demanded they keep me until they find out the answers to what was wrong. They admit me for observation and did some testing. Just to make them realize how serious this might be I get them thinkinga little faster by them having to call a code-blue on me. Ok, now we know, whatever it is definitely is life threatening. They decide to put me in the cardiac section of the hospital since I needed to be watched closely. Surprise, surprise. As a nurse was checking my vitals the feeling hit me again. This time, though, I warned the nurse. I advised her that it was the same feeling I had before the EMTs showed up at my mom’s house. I remember telling her something is going to happen to me. I was a code-blue once again. I woke up to a sight that was pretty scary. There had to be every doctor, nurse, and assistant on that floor all in my hospital room trying to help. So I lived through not one, but two near death experiences. Two things in my life I’m very grateful for every day. With test results back, probably coming as a surprise to all my non-believing doctors, I had pericarditis. I later would find out it was from the effects of spondylitis, an arthritic condition which affects the spine and also can effect the eyes, heart, lungs just to name a few and your whole immune system. There was a pint of fluid around my heart and fluid built up in my lungs. An emergency heart surgery was performed. From that day forward my doctors were well aware that I know my body much better then they do. It is very unfortunate that it had to come to this level before I was heard. On a side note, a year later we moved and I had to get my health records from my rheumatologist. As I’m reading through my charts I come across a letter to him from my internal medicine doctor, the “disbelieving” physician. The letter was dated November 10, 2003. In the letter he states, “I think there may be some significant psychiatric overlay that may be related to her pain,motherwise not much to base this on.” He goes on further to state, “I do, however, think her pain is over represented today and I would refrain from any stronger medications than anti-inflammatories.” Wow, I couldn’t believe what I was reading. Four and a half months later, I coded twice and needed emergency heart surgery. So the respect of that doctor from me was done. If he only would have listened a little longer, believed his patient a little more and examined a little better, maybe the emergency part of the surgery would not have been in this story. Doctors need to start taking what the patient tells them to heart. Luckily mine didn’t end in a tragic death, but the next patient might not have such a happy ending. Anyway, I now could start my treatment for spondylitis along with my fibromyalgia. This did not end the journey of finding what works for me. The list of medicines continued to grow and the pain was still there. I stayed in bed most of the time. Very rarely went out and did not spend time with my family. I became very depressed and thought this was how the rest of my life was going to be. At age 34 my life had absolutely no appeal to me. I was unable to walk much and had to use a wheelchair or cane for any outings. Finally, after years of complete suffering, my rheumatologist and I have finally found the medicines that work for me to slow down the progression of spondylitis and also to make living with fibromyalgia manageable. I now do not need any wheelchair and can live a better life with my family. I am accepting the fact that symptoms will worsen again. My rheumatologist and I have talked about options when this occurs. After many, many doctors I have now found the one who takes me for my word. Patients must form a “bond” with their physicians. If you are not feeling a connection with your current doctor or specialist you need to move on and try another one. It’s not always fun to keep having to repeat everything to a new doctor but it is worth it for sure. Working together as a team is crucial in finding diagnosis and a treatment plan that works for you. Fibromyalgia and spondylitis affect me every single day of my life. I need to think before I do the simplest of things as cleaning the house or going somewhere that I will be standing for too long. If I decide to do an extended outing with my family, I must realize the next day I must plan for a minimal exertion day because my body will be feeling the effects of the bus day. Resting my body when it is calling for it is important. If I overdo it too much I will possibly need a week or more to recover. On a day to day basis I never know how I will feel when I awake. Within a half hour after getting up I can usually tell you how the rest of the day will go. At that point I can plan for what I have the strength to do. I even have to plan differently for each season. Winter time is very rough on me. The pain and fatigue level is greater so I usually “hibernate” so to speak. The summer months are the best for me. The warmth of the sun is undeniably a pain reliever for me. I also laugh and give myself a name of the “human barometer”. It seems I can predict the rain better then the meteorologists, as a lot of people can do with auto-immune diseases it seems. I have a feeling come over me that I would not even be able to explain. The pain right before a storm is at a very high level. Then when the rain starts, the pain starts to subside. A week before my menstrual cycle my body goes into overload with pain. The hormones are being activated and my body fights back kicking and screaming. It is frustrating when I have plans and my body does not cooperate for them. To cancel on friends who do not understand what I’m going through is never easy. My family does have enough knowledge of spondylitis and fibromyalgia to know that I have my bad days and that we must adjust accordingly. So for us who have to live with auto-immune diseases there is a lot of decisions having to be made on a daily basis even before we start our day. The pain and fatigue is usually quite great. Learning to accept what I have has been a huge part of moving forward with my life. My life motto is “negative to positive”. You create a lot of strength within yourself when you have been to the lowest of lows and come out still alive. The views of my life are much different now. I made it through years of complete frustration with not knowing what would become of me. I had pain so great that I wanted to just sit in a corner to cry my days away. I’ve come to the conclusion that my life is too precious to just sit back and watch the days, months, years drift by. My children are too important to me to sit back and not be involved in their lives while growing up. The marriage to my husband is priceless and for me to waste that love on my own pity would be completely selfish. I made it through the worst and now I am going to make sure that the progression of my spondylitis is limited to the best of my ability so that my life may go on and that I may enjoy every breath I take on each new day. I will keep my fibromyalgia manageable the best that I can. I never know when or if I will get worse. I have accepted the fact that I will have flare-ups for both. I do know that I can not live worrying about things I have no control over. If it happens that my conditions worsen, which is probably inevitable, my family and I will make the necessary adjustments to medications and lifestyle changes to ensure I have the best quality of life I can. We must spend each day seeing the positive. We must see the importance of our lives. Teamwork with your physicians is always the best option. Also, patients need to really get to know their own body well. Journaling is a great way to look back and see where you have been and what hurts you and what makes you feel better. I look back on my medical notes often to see where I’ve been. It helps me when I’m having a bad day and look back and see I’ve been through worse days and have made it through. When you go to a doctor with facts on paper to what has been happening to you it is easier to see a pattern. Do not give up on being your own self health advocate and do not stop until you find your answers. We must have determination and strength. Have patience on the road we will travel and be happy and grateful for each new day. 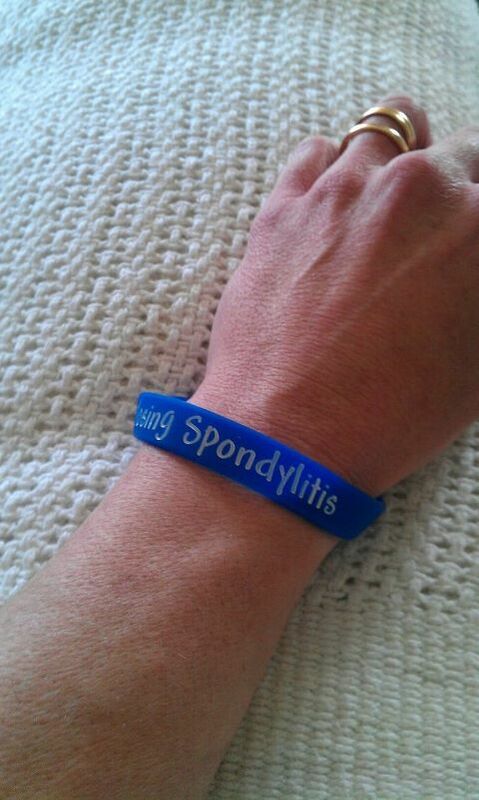 When I started this project it was to make people aware how Ankylosing Spondylitis affects our lives and our families lives. I wanted us to know we have each other to rely on, either to offer comfort or to gain strength from and how important that is. I felt it would be life changing for many of us to know we are not alone in our challenges. I wanted this site to make such a strong statement that people couldn’t help but be touched and changed when they left our site. The truth is I didn’t expect to be so strongly affected by this. Oh I knew I would cry and smile and understand and grow, but I didn’t realize how much I would heal. I didn’t realize not only would my attitude change, but my soul would. I struggled getting your story to line up perfect, not sure it is now, but I hope so. Yesterday was a difficult day for me, this year has been a very hard battle for many reasons. I felt lost, and desperate. It’s funny how life is, by word press not being cooperative with your story it allowed me to read it over and over and over and every letter soaked into my soul and gave me the strength that I needed at this very moment. I will be forever grateful that you took the time to write your story. None of us realize how much we make a difference in people’s lives in the simplest of ways. I think when you look in the dictionary for unconditional love your name should be there for what you did for your sister, I think when you look up courage your name should be there and when you look up determination it should be there also. To say you are amazing seems like such a small compliment. Thank you so much. That means a lot. It’s a crazy, windy road we travel with lots of detours along the way. But also there tends to be a beautiful road trip in the midst of it all. We all have many things to be grateful for and its all about concentrating on the blessings despite the road blocks. I know I am, along with a lot of other people, very appreciative of the tiring work you do to raise awareness to this frustrating disease. It fills my soul knowing that the majority of people that I’ve meant through having AS are the most compassionate and courageous humans on earth. . Take care of yourself. Thank you so much for your kind words. That has been one of the greatest blessings about this disease is the people that I have been blessed to meet and have in my life. I have met so many amazing and compassionate and courageous people, such as your self. Believe me it’s my honor and pleasure to do this and other projects, makes me feel valuable. I love doing it. I love being a part of such amazing people. Thank you and blessings to you and you take care of you! Denise, I started to tear up when I read about your decision to be a surrogate. What a wonderful choice! So much love. Like you, stress and insect bites were the triggers that sent me spiraling downward. It’s always helpful to hear others AS life stories. There’s a long list of similarities between all of us, but at the same time other parts of AS take a very different journey in each of us. Thank you for sharing your continuing story.